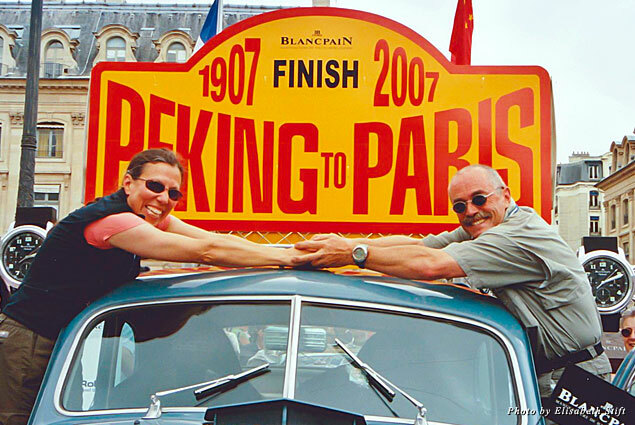 The 2013 Peking to Paris Motor Challenge departed from the Great Wall in China on May 28, bound for Paris. More than 95 classic cars, many of them the most rare of their kind, were flagged off from Beijing’s Badaling Gate at one-minute intervals, heading north to the China-Mongolia border at Erenhot. From there, they’ll push north through the emptiness of desert Mongolia into Siberia. They’ll traverse southern Russia into Ukraine, then Slovakia, and lastly into the benign alpine pleasures of Austria and Switzerland before finally reaching France. 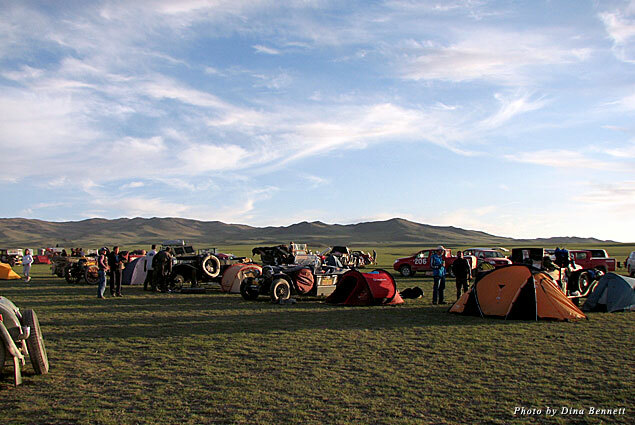 Some call this rally the hardest in the world, with cars negotiating the car-crippling wastes of the Gobi followed by Russian expanses so vast and endless they sap the spirit of even the most optimistic teams. And then there are those arbitrary delays imposed by bribe-seeking Russian road police, intent on cadging extra rubles from weary drivers. For us, it all started in 2004, when the renowned Colorado Grand stopped in our town. While surveying the gorgeous Selbys and Austins my husband and I wound up talking with one particular car owner. We ate lunch on the shady front lawn of our 100-year-old courthouse and, chatting in between bites of grilled elk burgers, we found many things in common, including a love of road trips and classic cars and the inevitable adventure that follows when the two are combined. In 1907, the French newspaper Le Monde issued a challenge to fearless motorists everywhere: prove the world was so modern, and borders so irrelevant, that a man could drive his car from Peking to Paris. And they did! Prince Borghese won that race, taking three months to complete the route and arriving in Paris to many cheers and a case of Mumm Champagne. Although this year’s race is shorter than the one I did in 2007, and drivers will spend more days in Mongolia and fewer in Russia, the participants will surely have similar experiences. What a trip that was! The rally was 35 days of non-stop revelations. Throughout the Chinese countryside, villagers lined the roads and hoisted their children on their shoulders to watch us pass. They crowded around us at gas stations to photograph cars, sit inside them, and shake our hands. In Mongolia, we braved a sandstorm in the Gobi. During days of driving on cruel washboards, we kept our eyes peeled for Bactrian camels migrating to summer grazing grounds. At night, under skies sparkling with stars, we pitched our tents by rivers; once, we even had the luxury of a fixed yurt camp with beds and a wood-burning stove for heat during the freezing night. Upon reaching a good stopping point, weary teams would wash up, pull a clean shirt and pair of slacks from a duffel bag, and have dinner. These copious buffets were our personal fuel, the main meal of each brutally long day. We’d linger at the table long after the plates were cleared and cake icing was licked from fingers. The evening camaraderie fed our spirits. We shared stories, laughing at each other’s travails. Inevitably we found wine and passed around bottles of whisky secured from the start in Beijing. 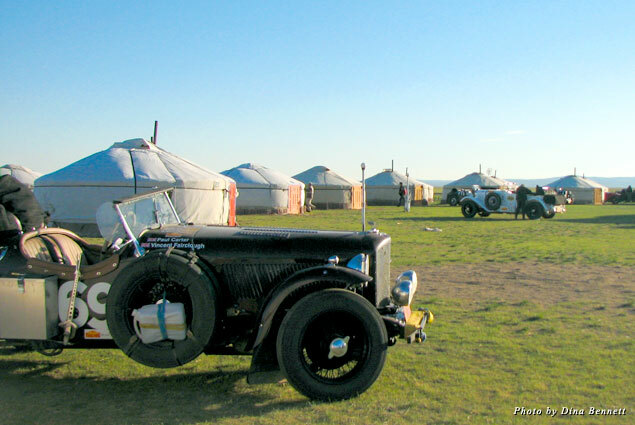 By the time we entered Russia we were exhausted from the bone-shattering conditions of Mongolian roads and tracks. We had also become old hands at repairing our cars. Every evening, the scene at the camp or hotel parking lot was the same: cars jacked up, engine hoods lifted, tools, spares, and hand clothes strewn about as every team on the rally checked its vehicle to see what had come loose, broken, or fallen off during that day’s drive. Those with complete toolkits, like us, were able to complete most repairs on our own. Many needed assistance from the capable team of mechanics traveling with us, often towing broken cars into camp until the wee hours of the morning. At one time or another, we all resorted to village repair shops, a local welder, or a vulcanizer with expertise in tires and tubes to keep our cars moving. Russia never seemed to end, and we understood how its sheer size alone challenged Napoleon; thankfully we did not have to battle the snow! A sobering lesson in history, we drove day after day through the region hosting the most feared prison camps of the Stalin Gulag system. We passed onion-domed churches covered in blazing gold leaf, followed by bleak prisons surrounded by concrete walls and topped with tangled coils of razor wire. The most popular spot in each night’s hotel was the bar, where cocktails and padded chairs made our evening get-togethers more comfortable. When we finally cleared Russia and entered the Baltic state of Estonia it was like having our lungs pumped with oxygen at the summit of Everest. We were free, the people were smiling, and we could stop wherever we wished without fearing we’d broken some unwritten law. From there it was a quick day’s drive through Latvia and Lithuania, before entering Poland’s bucolic lake country. There was time for thrilling time trials along country roads bordered by yellow sunflowers and through deeply shaded forests. We’d zip by the occasional farmhouse, each chimney topped by a ragged stork’s nest. Ice cream and delicious sour cream herring were available. As the days became increasingly fatiguing, it was a relief to know we were in a country where people readily understood English and had fully equipped repair services. On the last day, as we drove through Paris to Place Vendôme, nearly 90 percent of the cars that departed Beijing crossed the finish line. Everyone was beyond euphoric. Many of us cried as family and friends welcomed us back to normal, stationary life. 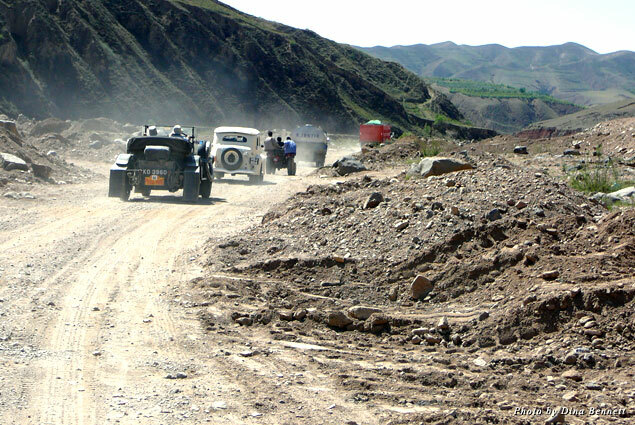 The 2007 Peking to Paris Motor Challenge was a remarkable accomplishment for each team, for the cars themselves, and for the Endurance Rally Association, which organized and supported the race. It was, in all senses, a once-in-a-lifetime experience. I wish the 2013 teams well; I’m thrilled they will have an adventure like mine. And I am happy I will be able to hear about it from home. 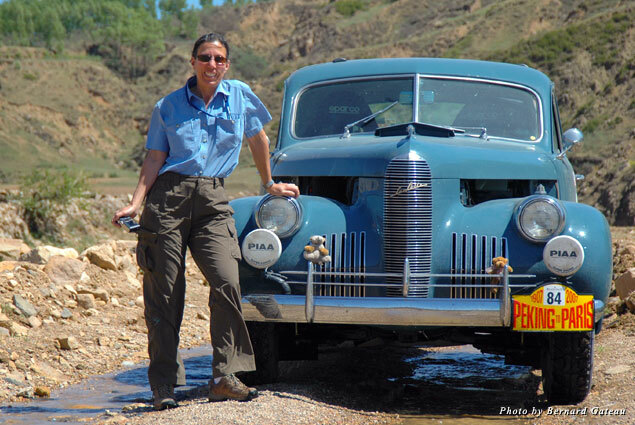 Dina Bennett is the author of “Peking to Paris: Life and Love on a Short Drive Around Half the World,” available in bookstores now.